Why use International Advantage Group to sell your property? We can provide your property with additional U.S. and International exposure. In addition to the mainstream market, we specialize in serving the fastest growing segments: Latinos & Chinese with our bilingual agents. These groups tend to purchase through established personal relationships. Therefore, we provide you with additional potential buyers that are not reachable by other agencies. These buyers traditionally buy in cash, eliminating mortgage uncertainty and shortening closing time. When listing with us, your property will immediately be marketed to our entire International Referral Network of Real Estate professionals. 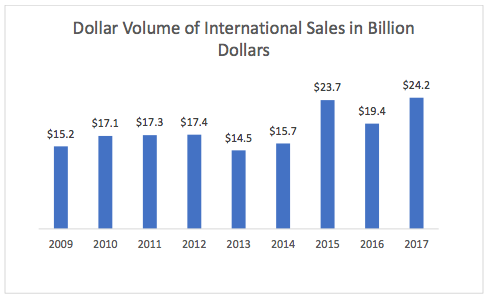 Foreign buyer purchases of Florida residential properties increased to $24.2 billion ($19.4 billion in 2016). This accounted for 21 percent of Florida’s residential dollar volume of sales (19 percent in 2016). Our group leader has earned the Certified International Property Specialist (CIPS) designation. To earn the CIPS designation, REALTORS® complete rigorous coursework devoted to learning cultural differences and international business practices. Designees must also prove achievement in international real estate transactions. Members of the CIPS Network are crucial players in today’s global real estate market. We are a member of the Space Coast Association of REALTORS®, Florida Association of REALTORS® and the National Association of REALTORS®. As such, there are many tools available that assist us in completing a smooth transaction. These include entry into the Multiple Listing Service used by all REALTORS® which feeds into the most visited Real Estate website realtor.com, as well as providing Florida Real Estate contracts and transaction management systems. All of this comes at a cost that we cover. We have sold more than 100 million dollars of Real Estate and have had to deal with many unexpected issues. That experience can save your deal from falling apart. Each of our agents have had successful business experience in other areas. They are all very professional and motivated to provide great service. More about OUR AGENTS. It's no secret that 90% of buyers use the Internet to begin their search. When you list with us our Listings are featured on websites around the world in 19 different languages. No matter where your buyer comes from, the information on your property is available in the language they speak. There are now about 4 million foreign born Florida residents that are not considered International Buyers. We specialize in reaching both of these rapidly growing markets. WASHINGTON – Dec. 8, 2015 – Half of all homeowners (48 percent) who decide to sell their home without agent representation believe that it will take a little extra work but be worth it because they'll save money on commissions and closing fees. But research finds that for-sale-by-owner (FSBO) sellers actually spend a lot more time than they imagined just to end up with a final selling price that's lower than comparable listings sold by an agent, according to research by the National Association of Realtors®. Most (89 percent) homes sold this year included the assistance of a real estate professional, according to NAR's 2015 Home Buyers and Sellers Profile report. But a small number of people (8 percent) still preferred to do it alone – a record low of for-sale-by-owner transactions, according to NAR's survey, which dates back to 1981. "In reality, homes sold by the owner make less money overall," according to NAR's Economists' Outlook blog. According to NAR's survey, the median selling price for all FSBO homes was $210,000 last year. When the buyer knew the seller in FSBO sales, the number sinks to the median selling price of $151,90. However, homes sold with the assistance of an agent had a median selling price of $249,000 – nearly $40,000 more for the typical home sale. Buy or sell with us and support 10% of gross income after agent commissions goes to this impactful non-profit org.